The Archdiocese of Indianapolis ordained its first permanent deacons in 2008 (and incardinated its first permanent deacon one year earlier). This office runs our Deacon Formation Program. 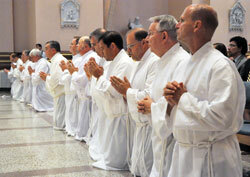 Additional classes of deacons were ordained in 2012 and 2017.